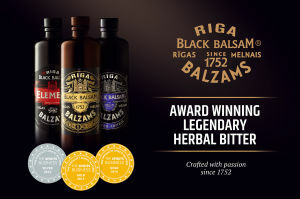 JSC Latvijas balzams informs that the company has received more than 10 awards this year. “This year, for our participation, we deliberately selected the most influential international competitions where world-renowned experts assess the beverages in blind tastings. Each such award not only serves as a proof of the ability of Latvian-produced beverages to compete with the global brands, but also helps opening the doors to new markets and sale”, says Dana Hasana, Head of Communications of the company. and two bronze awards from the International Wine&Spirits Competition 2016 in Great Britain (IWSC), which is one of the most prestigious competitions in the industry and takes place for the 47th time already. 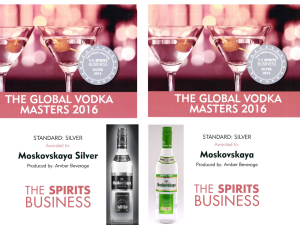 Despite the massive competition in vodka production worldwide, Latvian-produced brands Moskovskaya® Osobaya and Moskovskaya® Silver have represented themselves amazingly by receiving silver medals in The Global Vodka Master competition and the International Wine &Spirits Competition 2016. “These awards clearly help us in marketing the brand and boost the sales both in existing and new strategic export markets, which we consider interesting, such as the Americas, Spain, Lebanon, Malta, Ireland, etc.”, says Dana Hasana, Head of Communications of the company. Representative of the producer also notes that company is especially boasts with the high score received by the new Moskovskaya® Silver vodka (in picture) whose production started just this year. This is the first new product under the brand Moskovskaya® during its over-a-century long history. Our technologists have brought the Moskovskaya® recipe to perfection with obtaining an especially mild taste from using an additional filtration technology. Moskovskaya® Osobaya, which definitely qualifies as vodka classics, has received the Superior Taste Award from the International Taste & Quality Institute in Brussels. 15 internationally recognized sommeliers and chefs evaluate the taste quality parameters are evaluated for beverages with paying special attention to harmony between the beverage and food. In addition, the gold-filtered sparkling wine Cosmopolitan Diva®, first of its kind in the world, received the Superior Taste Award. The company started its production in 2014 with a direct focus on export, and this beverage is now being exported to 15 markets worldwide, largest of which are China, the Baltic States, Israel, and Great Britain.